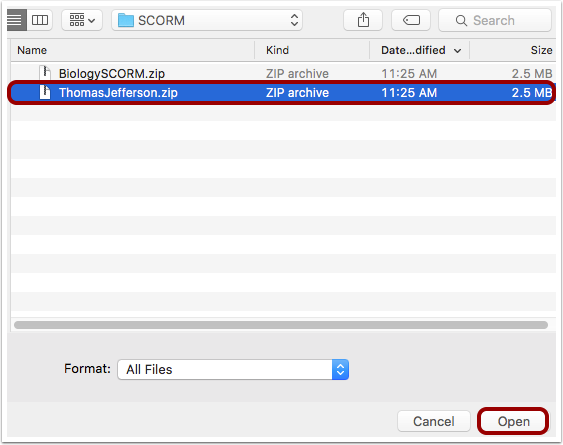 If your institution has enabled the SCORM LTI, you can upload SCORM ZIP files as assignments, discussions, or quizzes in your course (per the applicable package content). SCORM is a technical standard for many e-learning products and is often used to create course content. 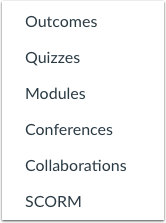 Once enabled, the SCORM Link will appear in the Course Navigation menu. SCORM packages are imported as External Tool Assignment submissions. To enable your SCORM content as a stand-alone HTML site, you may need to re-export your SCORM content. If you are interested in uploading non-assignment SCORM content into a course, learn how to import .zip content into Course Files. The SCORM LTI must be enabled in External Apps at the account level before it can be used in courses. If you are an administrator, please contact your Customer Success Manager for assistance. If you delete a SCORM assignment from the Assignments, Discussions, or Quizzes pages, the assignment will still appear on the SCORM page, and if you try to open the assignment, Canvas will generate an error. However, if you delete the assignment from the SCORM page, the assignment will also be deleted from all other applicable Canvas locations. Canvas supports the following versions of SCORM: SCORM 1.2 and SCORM 2004 (2nd, 3rd, and 4th Edition). SCORM is not available in beta or test environments of Canvas. In Course Navigation, click the SCORM link. Locate the file and click the Open button. Once the file has loaded, click the Choose Import Type drop-down menu. Choose to import the SCORM file as a graded assignment  or ungraded assignment . Note: If content does not immediately load, your LTI tool may need to be reconfigured. Please contact your admin for assistance. To view the Assignment in Canvas or edit assignment details, click the Assignment icon. You can also view the assignment in the Assignments page. Once a SCORM package has been imported, the assignment can be moved to an assignment group, added to modules, or managed like any other assignment in Canvas. If you want to preview the SCORM content to see how students will view the assignment, click the Preview icon. 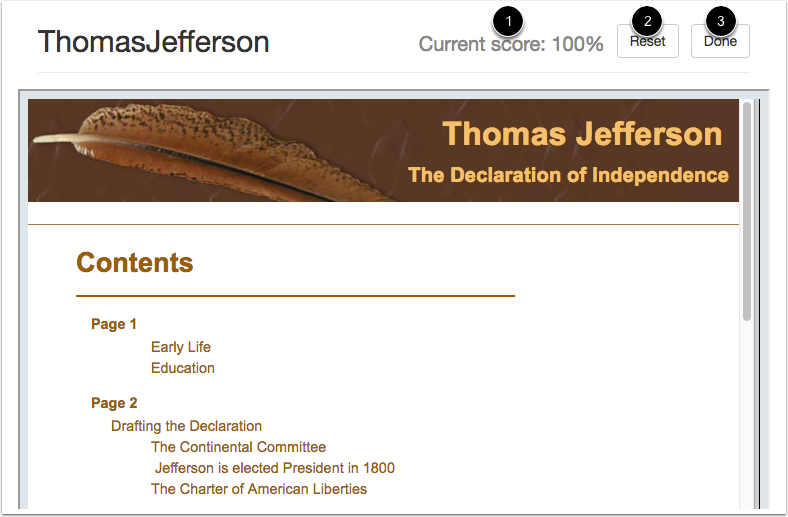 If you complete the assignment in the preview, Canvas will update the score to display how the score  appears to students. All package uploads default to 100 points. To reset the test content, click the Reset button . When you are finished with the preview, click the Done button . To delete a SCORM file, click the Delete icon. Note: If you delete a SCORM assignment from the Assignments, Discussions, or Quizzes pages, the assignment will still appear on the SCORM page, and if you try to open the assignment, Canvas will generate an error. However, if you delete the assignment from the SCORM page, the assignment will also be deleted from all other applicable Canvas locations. Previous Topic:How do I move or reorder an assignment? Next Topic:How do I delete an assignment? Table of Contents > Assignments > How do I import SCORM files as an assignment? Re: How to take a video created in Camtasia 9 with embedded quizzes to playback in Canvas?